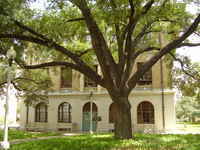 The design of the Education Building (later named Sutton Hall after William Seneca Sutton, the first dean of the School of Education) came after Gilbert's success with the library. 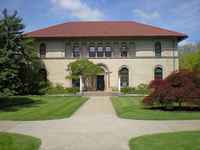 Sutton was designed in the Spanish Renaissance style, with brick and limestone facades and a shallow pitched hip roof, clad with clay tile. Gilbert's selection of materials was based both on practical and poetic concerns. 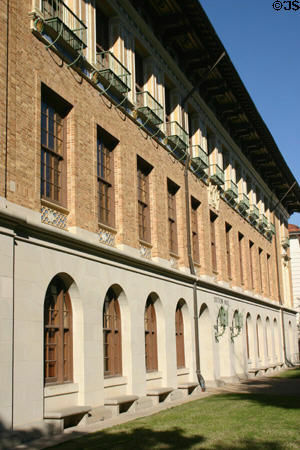 Limestone, brick, and terra cotta are well-suited to the Texas climate, while the style paid homage to the history of Texas as a Spanish colony and part of Mexican territory. Gilbert's attention to detail is evident in the design. The soffits are detailed with wood carvings; custom-designed iron lanterns grace the main entry. 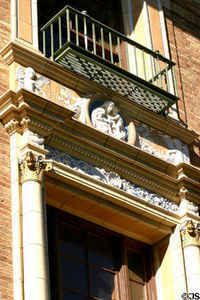 Stone bas relief and terra cotta decorations enliven the orderly facade. 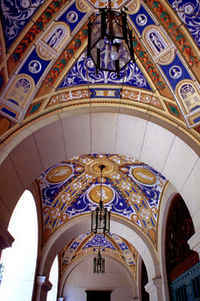 The most striking feature of Sutton Hall is the double vaulted arcade with its colorful ceiling mosaics.